For Porsche, one of the most successful brands in motorsports history, it can be hard to stay humble. In recognition of their new effort, Porsche has created a video to remind everyone that new circumstances require starting anew, not resting on their laurels and past successes. This eighty-eight second video below doesn’t tell much about the program, and hints that the brand has a lot to learn about Formula E. With just fifteen days of testing allowed before the start of the 2019-2020 season, they certainly have a lot to learn in a very short span of time. 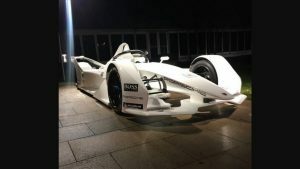 Porsche’s Formula E car first took to the track in March for the first of 15 days of pre-season testing, and returned to the track in Spain for three days of additional testing with Brendon Hartley and Neel Jani. As we noted in our previous feature on the new car, the Porsche will share its Spark chassis with the other cars on the grid. Powertrain technology is proprietary to each team, and must not exceed 250kW plus a 10% overboost mode. Batteries must last the duration of an entire 45 minute plus-one-lap race. With Porsche’s first season in Formula E looming on the horizon this fall, it’s refreshing to finally see the car turning laps at Porsche’s testing grounds in Weissach. The 2019/2020 season entry requires a spec Spark Racing Technologies chassis—The SRT05e—but electric motor and battery technology is proprietary to each team, so long as it produces no more than 250 kW plus a 10% « attack mode » boost. The batteries must be long enough to last the entire 45 minute plus one lap race. Porsche says its newly developed full electric powertrain passed without incident. Considering Porsche’s own Taycan road car is expected to produce at least 320kW on the top end, it’s no surprise that the motorsport engineers have been able to reliably produce a bit less for the FE car. I seriously look forward to seeing Porsche compete in this highly interesting and forward thinking series. It’s nice to see Porsche back in open wheel competition, and with electric power so important to the company, it is a no-brainer. I’m always happy to cheer for Neel Jani. And it’s always nice to see a race car running laps in bare carbon. This thing looks like the future!